Espresso 101: What is Crema? You may have heard the term “crema” being thrown around before but been unsure what all those baristas were talking about. Perhaps you have been curious before about what makes a shot of espresso sometimes mimic the foaming aesthetic of a Guinness beer. What you are seeing, and what all of those coffee enthusiasts are raving about, is called “crema” and it is widely considered to be a gold standard in espresso brewing. The fine layer of crema that sits on top of your espresso has a long history and can tell you quite a bit about the espresso that you are about to enjoy. Let’s dive in! Why Did Crema Become Such a Big Deal? Simply put, the crema is what we call the light layer of dark tan foam found on the surface of a shot of espresso. Technically, the crema itself does not impact the taste of the espresso, but coffee experts generally agree that the crema is a good indication of what the quality of the rest of the espresso will be like. Crema is formed during the extraction process when water and coffee bean oils emulsify. After coffee beans are roasted, they begin to release CO2. Most of that is released into the air between roasting and grinding, but what CO2 remains in the cells is released during grinding. When hot water hits the coffee grounds with the high pressure of an espresso machine, the water emulsifies the oils in the coffee and then gets supersaturated with CO2, resulting in lots of tiny bubbles that make up the foamy layer of crema. For an interesting visual demonstration of the science behind crema, check out the video below. 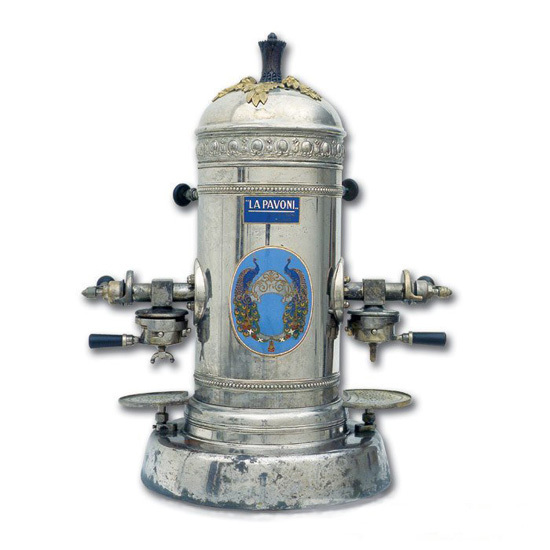 That being said, crema was not a component in espresso until 1948 when Achille Gaggia began selling the modern espresso machine using a lever-driven piston to force water through coffee grounds with more pressure than was previously possible. 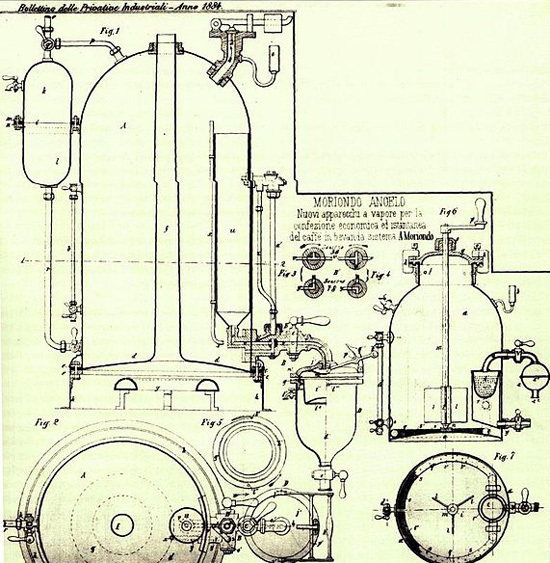 The first patented model for an espresso machine was designed by Angelo Moriondo of Turin, Italy in 1884. His machine was capable of using two separate boilers, 1.5 bars of pressure, and both steam and water to produce espresso. It was quite revolutionary at the time and the Smithsonian actually has a schematic of his patent, so you can imagine what it may have looked like in person. Gaggia’s new invention is credited for giving us not only the modern espresso machine but also modern espresso: the high pressure was now capable of creating crema on top of a shot of espresso. 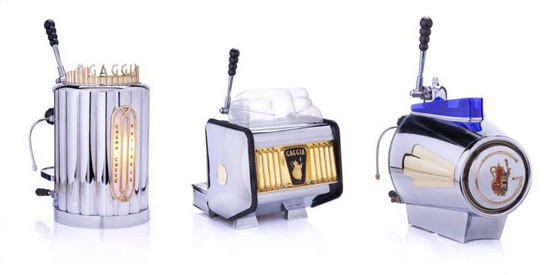 Historical anecdotes suggest that consumers were at first wary of the layer of “scum” on top of their espresso until Gaggia started referring to it as caffe creme, insinuating that his espresso was of such high quality that it produced its own creme. From that point on, crema has been considered an indicator of espresso quality. There are a few tell-tale qualities that determine whether or not a crema is “good” or not. More importantly, there are a few aesthetic indicators of an unhealthy crema, which may be a sign that your espresso is also unhealthy. First, a crema should have the right balance of color: too dark is not a much of a problem, but too light is no good. Crema should be a tawny, red-gold color. Next, the crema should be smooth. If it’s gritty, you may have a problem. Crema relies on thousands of tiny bubbles to create a foamy, but velvety surface. There is no room for big bubbles in good crema. Good crema has staying power. Ideally, crema will last for about two minutes before it disappears into the rest of the espresso. A crema that lasts for under a minute may indicate a problem. The ideal crema is not too thick or too thin: most baristas aim to have a crema that takes up about 1/10 of the espresso. It’s important to note that good coffees can produce bad cremas and bad coffees can produce good ones. There are more factors that go into producing a pleasing crema than just quality. For example, Italian coffee companies are infamous for purposely including Robusta coffee beans in with their coffee blends simply because they produce a better crema. Robusta and Arabica are the two main coffee bean species used by coffee manufacturers worldwide. Arabica is commonly used by specialty roasters for its superior taste and quality, but Robusta produces a better crema. However, that crema comes at the expense of taste. The result is a beautiful-looking espresso with a less than desired taste. This is one of the many reasons you’ll find plenty of coffee experts who will encourage you to forget about the crema and just focus on making a great shot of espresso. Chances are a beautiful crema will naturally follow. See this video here for a basic overview of what makes a good shot of espresso. If you are feeling particularly curious, check out this video here for a longer explanation and basic introduction to some barista skills. There are a number of factors that affect the color, duration, thickness, and overall appearance of crema. Some of these include the temperature of the brewing water, the roasting date of the coffee beans, the length of extraction, and the species of coffee beans being used. There is a lot going on at once in your espresso demitasse cup. A better way to understand what affects crema is to work backward: what does the appearance of the crema tell you about the espresso you are about to drink? The three main things you can observe from your crema are the color, the thickness or fullness, and how long it lasts. There are huge amounts of color variations in crema, and not all of them are bad. Colors will vary as a result of lighter or darker coffee roasts. However, there are other color variances that signal a problem, such as dark rings around the edge of the cup or a crema that is too light. Exceptionally light crema is a sign that the espresso was under-extracted. In this case, the crema may also be thinner or not last as long. Under-extraction can be a result of any number of problems that happen between grinding, tamping, and brewing and simply means that not enough flavor comes out of the coffee grounds. When under-extraction is not the problem, lighter crema can also be a result of a cold espresso machine. Double check to make sure that your machine is still at the ideal temperature for brewing (195F-205F). On the flip side, a darker crema is likely a product of over-extraction, or when too much flavor was extracted from the coffee grounds. This is essentially the opposite problem of lighter crema so it could be an issue of too fine of a grind, too much pressure while tamping, or a shot that was pulled too long. If none of those issues seem to be the culprit, then an extra-dark crema could also be a sign that the espresso machine is overheated. There is a term that is common in the barista world called “tiger flecking” that refers to inconsistent dark spots in the crema of a well-pulled espresso shot. Tiger flecking likely has more to do with the quality of the roast you are using and your experience as a barista than anything you can directly control. This video below shows a shot of espresso being pulled with the highly sought-after but elusive tiger flecking characteristic. Freshly roasted coffee beans will generally produce a more pronounced crema. This is because beans that were recently roasted are still giving off some of the oils and gasses that begin to release after the roasting process. Those oils and gasses, as we learned, play a big part in creating the crema foam on top of espresso so you’re likely to notice a stronger-looking crema at a coffee shop that roasts their own beans. Another thing that affects the thickness of the crema is the darkness of the bean. Darker roasts generally produce less crema because some of the oils rub off during packaging and grinding. However, lighter roasts are not ideal for espresso crema either. Look for companies that sell espresso roasts made specifically with the right level of oils. Finally, the fullness of crema varies depending on how the roasted beans were processed: dry processed is most common and leaves beans with more of their natural oils. These oils result in a better, fuller crema. Conversely, washed or wet processed is becoming a more common option among artisan roasters and doesn’t give beans quite as much natural oil: the resulting cream lacks in thickness. If coffee is too freshly roasted, it is still releasing too many gases and oils to produce quality espresso so the resulting shot will produce a bubbly crema that quickly evaporates. The ideal time frame to grind and brew coffee is 7-21 days after roasting. However, that’s debatable and we’ve seen plenty of people advocate for the 12-24 hour rule of letting beans rest just a day or half a day before grinding and brewing. If coffee is freshly roasted—but not too freshly roasted—and freshly ground, the crema should last about 2 minutes. Over- and under-extraction can also impact how long crema lasts and will be the first signs that the espresso you have might not be the best tasting. Finally, many of the newer super automatic espresso machines will actually create a “fake” crema that looks like the real thing but is actually not an emulsification of the CO2 and coffee oils. These fake cremas won’t have the same taste or complexity as those pulled with a semi-automatic or manual espresso machine. If you’re a seasoned barista or coffee enthusiast, you likely have your own opinion about where crema falls in the spectrum of importance. If you’re just starting out on your coffee journey, you’re likely confused and frustrated. Like most fierce debates in the coffee world, it will likely fall entirely upon your own personal preferences. Crema adds body and lingering flavor to espresso, but it’s unlikely to be the only factor at work in making something you enjoy. For an interesting perspective from two coffee experts on how much crema can really tell you about your espresso, check this video out here. Part of the reason that crema became such a standard of quality in the espresso world is wrapped up in tradition. Much of coffee culture is a continuation of a rich history that extends hundreds of years into the cafes of Italy. By the time Gaggia and his crema-making machine appeared on the scene, good espresso was just as much about the presentation as it was about the taste. That may be one of the reasons that coffee experts have a lingering obsession with getting the crema just right. Another reason is that the crema does, in many ways, give us clues about the espresso we are about to drink, such as the age of the roast, the quality of the beans, the temperature of the water, and the length of the shot. All of that information tells us what we can expect from the espresso, but it does not give us a complete picture. One way to look at crema is as the first impression of espresso. It will be the first thing you can observe and the first tastes you get. Similar to experiencing a new wine or beer for the first time, the crema is part of the initial experience of a new espresso. Whether or not it is the ultimate judge of quality is really beside the point: now that you know what to expect and what not to expect, you can enjoy your espresso and decide for yourself what you prefer. Hey there, my name is Greg and I'm the creator and editor of Coffee or Bust. I've been in the coffee business for over a decade, and my goal is to help you make the best cup of coffee with recommended tips, tools, and tricks!